We know that lots of folk are keen gardeners, but many others prefer to just enjoy the finished product, or simply don’t have the time to manage and maintain their own garden to the standard they want. Many people have already chosen Ricky Tyler Landscapes to deliver the service they require, such as manicuring a lawn, keeping flowerbeds weed-free, and controlling those fast-growing hedges. 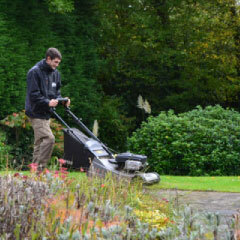 With over a decade of experience servicing more than 1,500 properties, we work with you to develop a weekly, fortnightly or monthly maintenance service that's scheduled to fit in with your plans; we always deliver the stunning results you’d expect whilst allowing you to enjoy your garden whenever you want to. Our Ricky Tyler Landscapes teams are trained to the highest of standards, and we replace our equipment and tools each year for best results. We have introduced our own strict customer service procedures and often carry out spot-checks on our team as they work to ensure that we exceed the standards you expect. Each of our vehicles also carries a wide range of sundries, such as feeds, stakes and the like, allowing us to solve any problems we spot as we work in your garden. For your peace of mind, our vehicles are distinctive, as are the smart uniforms worn by all our teams. Of course, we undertake full CRB checks and have all the necessary health and safety, public liability and employers' liability insurance policies. Being eco-friendly, we also remove all garden waste before we leave, and then have it recycled and composted if at all possible. Every garden is unique, so call us on 01707 324 262 or 07986 224 09 now for a chat about how your garden is now and could be in the future. Ricky Tyler Landscapes can provide gardening and grounds maintenance services including Garden Maintenance covering London, Essex, Hertfordshire, Northampton, Buckinginghamshire & Bedfordshire .